We have 1 big cottage with 6 self- catering rooms for somebody who prefers to stay in a personal and private surrounding. The cottage is in private compound in a garden setting with sunbeds. 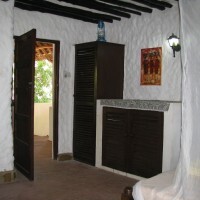 The whole cottage can accomdate upto 12persons. Therefore it can as well accomodate a group of friends,couples or a family. Our house was lovingly designed in Swahili- style.We offer traditional Africa combined with modern equipment. Handmade furniture and arts creates a lovely and relaxing flair under the shadow of the tropical garden,sorrounded with palm trees,mango trees,Baobab tree and bougainvilleas. Every room has a bountenious living- sleepingroom with a fan, bathroom and a covered verandah. From the cottage,through a clear path you reach the fine white sandy beaches within 5minutes walk.